I hate how scruffy packaging gets when it has that rubberized finish! Since having a sort through my Muji storage, I’ve realised how many blushes I have so am trying to make an effort to switch them up on a daily basis. A few have been on my favourites list recently, so thought I’d share the five that have been adorning my cheeks (not at once!) over the past week or so. 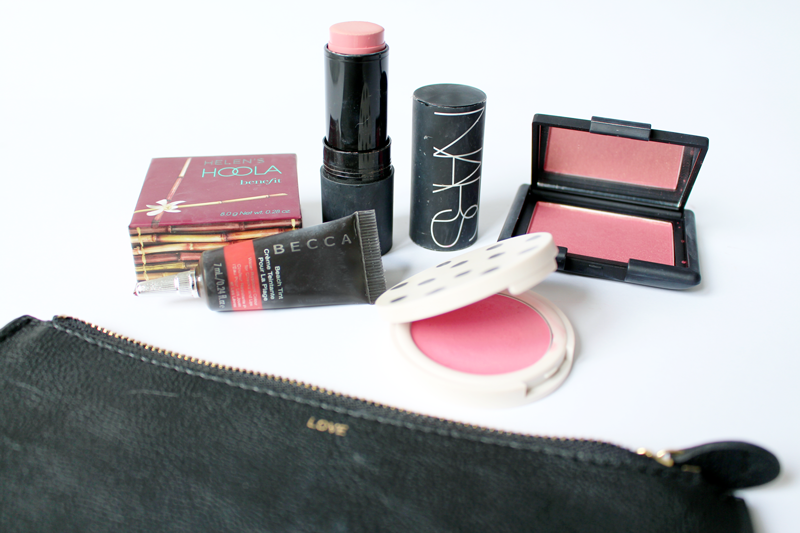 I seem to have a thing for pink blushes it would appear, so I’ll start with a high street option. The lovely bright Topshop Cream Blush in Afternoon Tea is a perfect, cliche ‘pop of colour’ blush that can be blended out to give a very natural, yet bright, flush to the cheeks. I’ve said it before and I’ll say it again: Topshop makeup is amazing for the price and their blushes are no exception. Next on the pink hitlist is NARS Powder Blush in Outlaw. There’s a slight gold shimmer running through it in the pan, but this doesn’t totally translate to the cheeks, which I much prefer. It’s slightly more on the raspberry red shade of pink, so adds a bit more depth to a makeup look and, of course, with NARS you know the lasting power and quality is always great. Another NARS favourite is the NARS Matte Multiple in Anguilla, which is the most lovely pinky/peachy shade. It’s a very natural tone on the skin but the thing I love the most is the creamy, blendable consistency and matte finish. Leaning away from pinks and going more for the blood orange side of things, the Becca Beach Tint in Papaya is such a beautiful shade. It has a liquidy consistency that you squeeze out of the tube and dot onto the cheeks, then blend out with a big brush. I love the formula of the Becca Beach Tints as they’re always so bright but can be made to be as sheer as you like. Finally, to add a bit of colour/depth and to try and disguise how I hate tanning my face, I’ve been using my Benefit Hoola Bronzer a lot more recently. I just apply it in the hollows of my cheeks, along the jawline and slightly on my temples for a hint of warmth which works nicely with my pale complexion! What are you loving at the moment? Oh and don’t forget to enter my Dahlia giveaway.